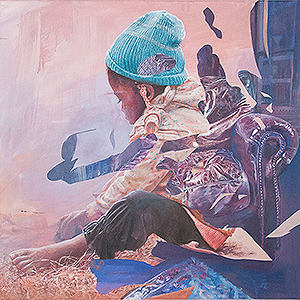 The Fullerton Museum Center in conjunction with the Dutch Consulate and Thinkspace are happy to present a small showcase featuring the works of artistic duo Telmo Miel. Telmo Miel are a muralist and image-making duo from the Netherlands, Telmo Miel is Telmo Pieper and Miel Krutzmann. They have worked together since meeting at the Willem de Kooning Academy in Rotterdam in 2007, officially becoming Telmo Miel in 2012. Their murals are both surreal and realistically rendered, with a tremendous amount of detail and vibrant color. Able to work fairly seamlessly, their styles have combined to such an extent that they’re able to execute multiple areas in tandem, exchanging places and completing each other’s work. They often execute their pieces on a monumental scale, creating huge architecturally sized spray-paint paintings on building façades. Combining multiple elements in a single composition, they layer references to the human and animal worlds to create complex creatures and fantastic scenarios. With positivity, humor and a touch of the romantic, their work is arresting and epic.